We caught the Porsche Taycan wagon undergoing winter testing ahead of its debut. Porsche is getting ready to reveal its first ever EV this year, the Taycan. As the debut draws closer, Porsche has begun winter testing the Taycan to see how critical components such as the battery and electric motors cope in cold conditions. Back in October, we caught our first glimpse of the Porsche Taycan Sport Turismo, and now our spy photographers have spotted the electric wagon being put through its paces in the snow. Compared to the Mission E Cross Turismo, the production Taycan Sport Turismo's styling has been toned down and the wagon also appears to have a more regular ride height compared to the high-riding concept. Like the Panamera Sport Turismo, the Taycan Sport Turismo will offer increased luggage space and more head room in the cabin for back seat passengers thanks to its higher roofline. The Taycan is expected to arrive with three different stages of power: the Taycan Carrera, the Taycan Carrera S, and the Taycan Turbo, with an output ranging from 400 to 600 horsepower provided by two permanently synchronous motors. The range-topping model is also expected to offer a 310-mile range. Initially, all-wheel drive is expected to be offered on all versions as standard, but Porsche could also launch a more affordable rear-wheel-drive version later down the line. Rumors also suggested the Taycan Carrera will be rear-wheel-drive from the start. 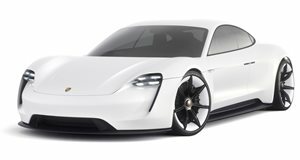 The Porsche Taycan will debut sometime this year, but it remains to be seen if the Sport Turismo will be unveiled at the same as its standard sibling.